At Fairview Sailing, we enjoy sharing the finer things in life with our dedicated customers and as such, we are thrilled to announce a brand new lifestyle partnership for 2019 with Devon based distillery, Salcombe Gin, who will be on hand to meet and greet visitors at a selection of events over the course of the upcoming season – stay tuned to find out more! To celebrate this new partnership with, we’re giving away a bottle of their multi -award winning flagship gin ‘Start Point’ with all new Fairview charters booked for April, including the school holidays and Easter weekend ,when you book and pay before 1st April 2019* – giving you just five days to plan your next trip and take up this amazing offer! 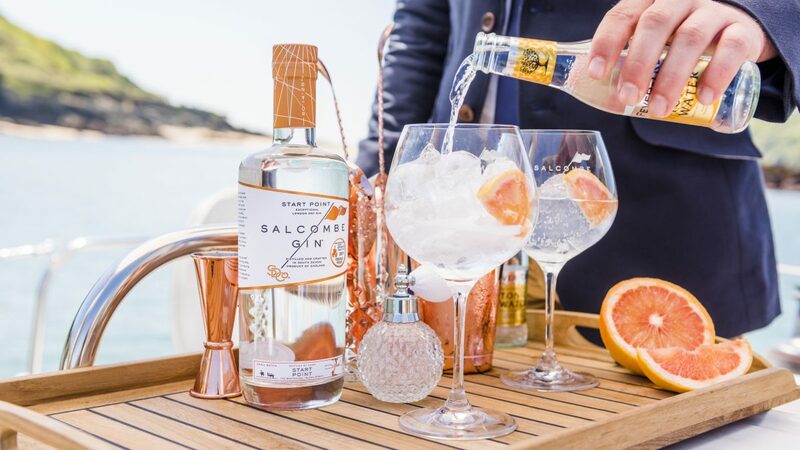 On arrival at our Port Hamble base we’ll welcome you with a bottle of Salcombe Gin’s flagship ‘Start Point’ ginperfect for your sundowner drinks aboard. What nicer way to start your April break, than with a cool refreshing ‘Salcombe & Tonic’ , especially as the weather forecast for April is looking so mild and sunny. Founded in 2014 by co-founders Angus and Howard, Salcombe Distilling Co. was born from a shared love of gin and the coastal town on Salcombe in Devon. Salcombe Gin itself was launched in 2016 and in its short life to date has won a multitude of awards, including Gold at the World Gin Awards. Take your pick from our fleet of over 40 yachts including Beneteau Oceanis 37s and our brand new Dufour 430 and 460GLs, and you could be exploring the Solent and south coast in the spring sunshine. If you have more time, you could even head further afield to the Channel Islands or Brittany. Alternatively, head for the West Country and visit Salcombe Gin’s Distillery, Bar and Gin School to learn more about the art of distilling gin. To book your Fairview charter this April, contact info@fairviewsailing.co.ukor call 02380 457023. *Does not apply to current bookings or in conjunction with any other offers. Bookings must be made and paid for before Monday 1st April 2019 for charters departing between 01/04/2019 – 30/04/2019.